“Stacey” is one of our favorite does in the barn. We love her short/thick/massive body, her beautiful stumpy front legs, her wonderful width to chest (it’s so voluptuous! ), and her beautiful head/ear/crown. We’re very thankful to have her with us! 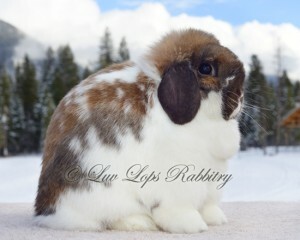 She is a Luv Lops’ Snoopy (black otter) daughter, which makes her even more special! We love Stacey and can’t wait to get more litters from her soon. Possibly carriers REW & dilute.